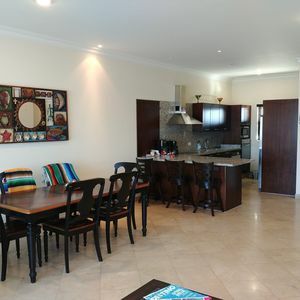 Ocean Front Luxury Two Bedroom Presidential Suite @Grand Solmar! 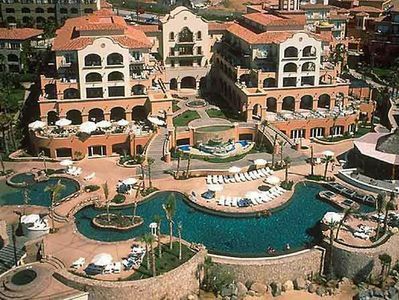 This resort is on the “private” Pacific side of Cabo, meaning no vendors on the beach always trying to get you to buy things. Beautiful view out the Pacific Ocean side and Pedregal homes. 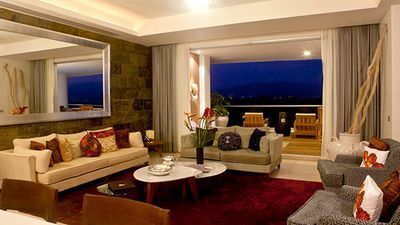 Presidential Suite includes two full bedrooms (a Junior Suite sleeping 4, and Master suite sleeping 2), full kitchen, huge living room with 16’ of sliding glass-wall doors to open to breathtaking views from a huge balcony! 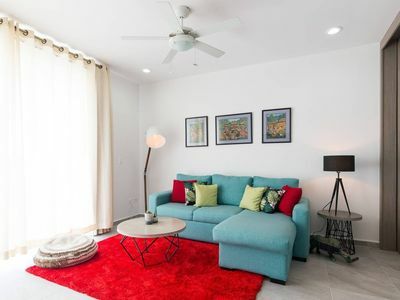 Also includes a seating area that has a queen size pull down Murphy bed (sleeping 2), with shelf and closet area, separate TV with a full third bathroom nearby. Overall about 2500 sq ft! Spacious Junior suite includes 2 queen size beds, large bathroom, two separate closets, a safe, full size dresser with TV and a sliding glass door for entry onto an expansive balcony. Master suite includes King size bed with full dresser. Disappearing glass wall sliding doors to a private Master balcony. An adjoining ‘dressing’ room has two full size closets with shelves on each side, chair and mirror for getting ready. Open two sliding wooden doors to enter a magnificent Master bath!! Dual sinks, separate glass toilet area, open walk-in showers and jacuzzi tub. 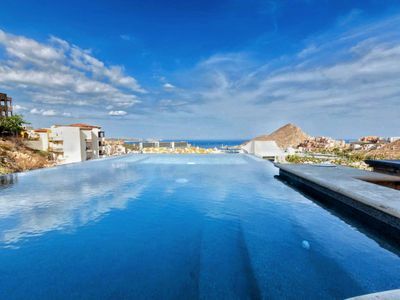 This is our Go To spot in Cabo and we are NEVER disappointed with the Grand Solmar resort. I can try to answer any questions. 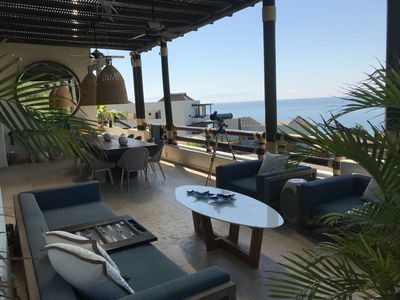 This luxury suite includes a fully equipped kitchen , living room, dining room, Three bathrooms, 1 king bed & a 2 queen and a Murphy bed w/ a private terrace overlooking the ocean. 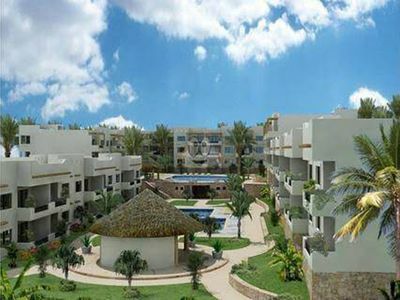 The resort includes 8 restaurants, a sports bar, a café, infinity pools w/ food & drink service, a gym w/classes daily, a full spa, a kid's club & babysitting services. 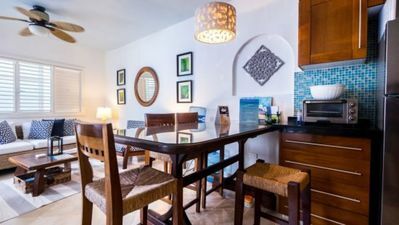 Within walking distance (or take a shuttle for an average of $10) is downtown Cabo & the Marina which offer a variety of dining, shopping, activities & nightlife. 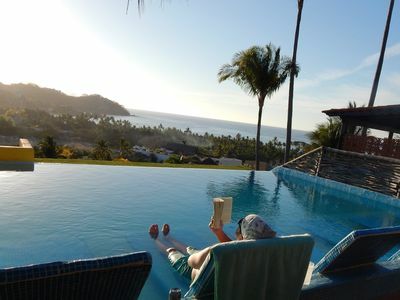 As one of the top vacation destination resorts in the world, Grand Solmar Land's End goes above and beyond to ensure you enjoy every moment of your stay. You arrive to first class service with a complimentary margarita while overlooking the luxury resort that sits along the Pacific Ocean. The facilities are pristine- from your suite, to the restaurants, to the pools. 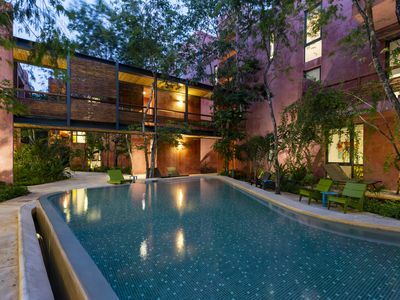 This is a dream resort that you see in travel + leisure and Condé Nast. The views are gorgeous and the service is impeccable! 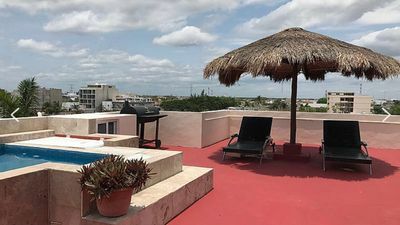 We will not be onsite since this is a vacation resort however we are more than happy to make recommendations and help make your stay as enjoyable as possible. Housekeeping cleans the suite daily, providing fresh towels and toiletries. The concierge is available in the main lobby to assist with accommodations within the resort or activities/reservations outside of the resort. All of the staff is extremely friendly. 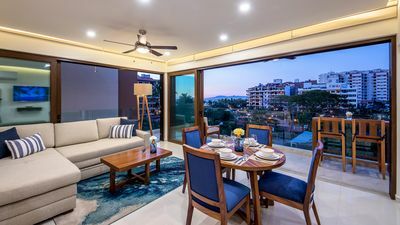 Cabo San Lucas is the ultimate vacation destination offering relaxation, adventure, delicious dining options and friendly faces everywhere you go. Tourist safety is a priority and after 7 years of vacationing there we have always felt safe. 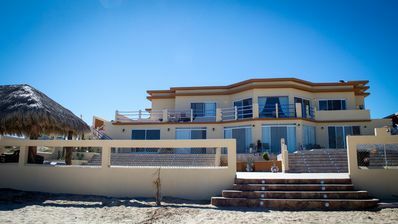 The location's natural beauty is breathtaking from the blue water beaches to the desert landscapes. 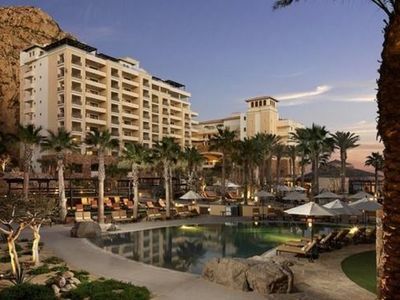 Grand Solmar Land's End Resort is a 10 minute walk from downtown Cabo and the Marina which offer a variety of restaurants, shopping and nightlife. At the driveway in front of the lobby, the staff will call you a shuttle bus if you prefer which averages $10 one way to downtown or the marina. 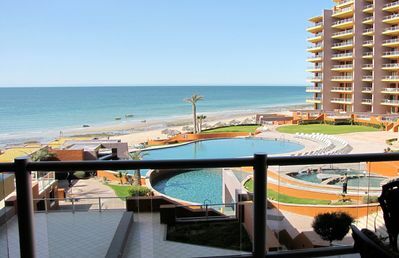 Also close by is Medano Beach that has a variety of ocean front restaurants and water activities such as paddle boarding, kayaking, boat tours, parasailing and jet skis. A shuttle ride is recommended, averaging $12 one way. 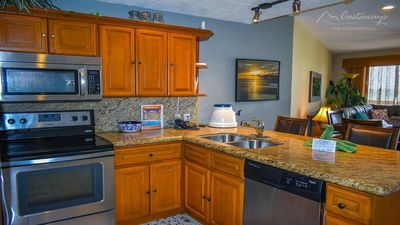 This suite is currently available use Saturday through Saturday or Sunday through Sunday. If you are interested in reserving please send us a message with any questions you have so when we check with the resort for availability we can book your week. 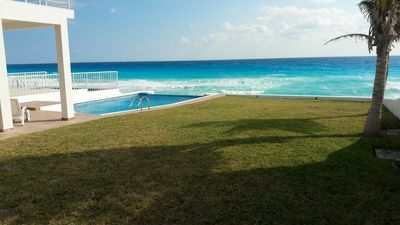 If you were to book this room directly from the resort, you would pay an additional $950.00 in taxes. No additional fees when booking with us. There is a strict cancellation policy due to the fact that we can not reschedule the week booked with less than 31 days notice. - All charges made to the room are the responsibility of the guest. - Any damages to the room are the responsibility of the guest. 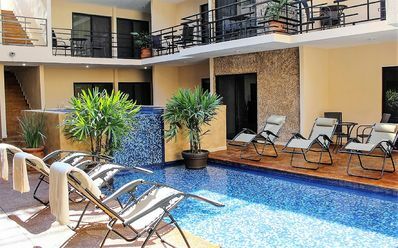 - No refunds will be issued if the guest is not able to stay the entire duration of the booked trip. - Please be courteous and tip the housekeeping , the suggested daily tip is $3/ day. Master suite includes King size bed with full dresser. Disappearing glass wall sliding doors to a private Master balcony. An adjoining ‘dressing’ room has two full size closets with shelves on each side, chair and mirror for getting ready. Open two sliding wooden doors to enter a magnificent Master bath!! Dual sinks, separate glass toilet area, open walk-in showers and jacuzzi tub that has a throw open window to your private Master balcony. El Refugio 3. 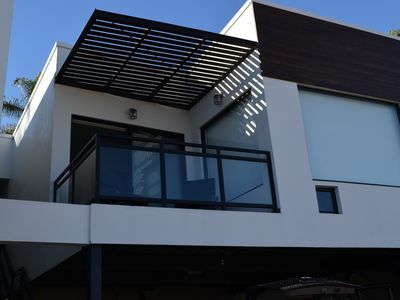 Best Place in the Heart of Ensenada with a Panoramic View. 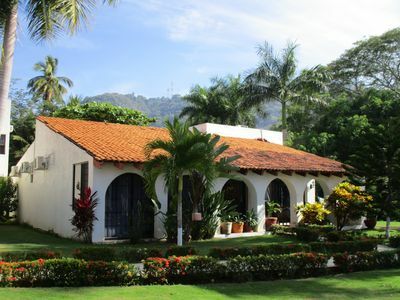 Hacienda del Mar. Spacious Villa. Beachfront resort!